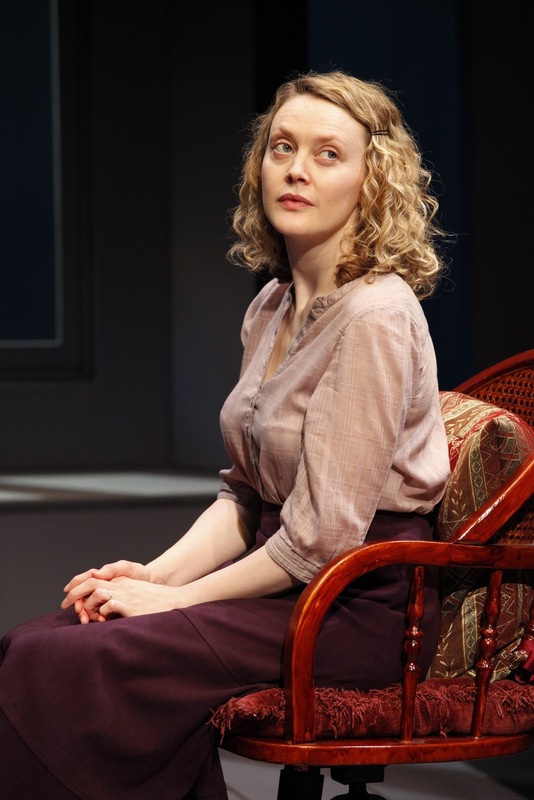 Monologue driven plays are not my favorite format, and Brian Friel’s Molly Sweeney is entirely monologue driven. Brian Friel is one of Ireland’s most noted playwrights, for Translations, Dancing at Lughnasa, Faith Healer, Philadelphia, Here I Come! and many more. I always admire his work but in general I like plays to have dialogue. 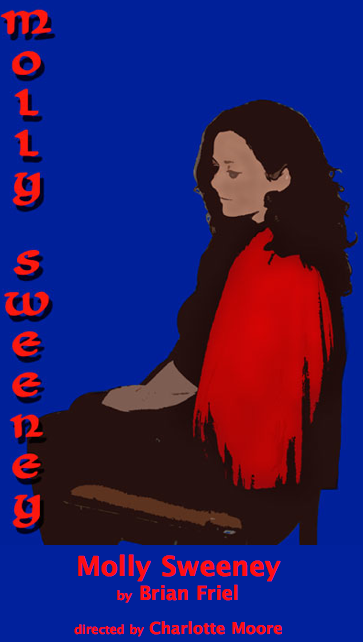 In Molly Sweeney, three characters speak about each other and tell their stories; they are all onstage all the time, and yet they never talk to each other. But in this play it works. It’s a play about blindness and sight, metaphorical and literal. Not only do the characters not see each other in space, they don’t “see” each other correctly as people either. And it makes you wonder– do we ever see each other? How clearly? I’ve seen the play before and not been bowled over– but in this production at Irish Repertory Theatre you can see why the show has been extended nearly a month. It was supposed to close on March 13, but now runs through April 10. And it should not be missed. Unfolding before your eyes is a production that brings to life all the terrible pain of hope. You just don’t see the world the same way afterwards. To make the extension work, the title role played by Geraldine Hughes had to be recast. Friel recommended Simone Kirby, who had played the role in Leicester recently, and, as I learned when I spoke to her for the podcast, has performed at birthday parties for him. Read full review after the jump! New York Critics loved the play– it got an “A” on StageGrade (a great site to read all the reviews of a particular show quickly). The Wall Street Journal’s Terry Teachout said it’s “so good that it actually made me shiver– repeatedly.” (I actually first met Terry at Irish Rep, his booming laugh made me turn around). I saw the play late in the run, partly because I was recovering from hand surgery, and all that snow, but also because– having seen the play before (notice how hard it is to use a sentence without some reference to seeing!) I knew that it’s kind of a sad story. It’s about Molly, a functional, cheery and essentially blind person (she can see light and dark, but has not seen more since early childhood) and Frank, her husband– a man who gets into various projects and causes– and the surgeon, Mr. Rice, himself a functioning alcholic, who operates on her and restores her vision. But disaster ensues. Because adjusting to a world of simultaneous input is very difficult for someone who experiences it in time– a flower is a petal, a stem, a leaf. Not all at once. What are babies doing in those first few months of life? well, one thing they are doing is learning how to interpret visual imagery. I already knew it would end badly when I first saw the play in the early 90s in Pittsburgh, because I had been an audio describer for the blind for Hospital Audiences, Inc., and the organization sent the trainees Oliver Sacks‘ brilliant article “To See and Not See,” from the New Yorker, later anthologized in his novel An Anthropologist on Mars. The article tells the story that inspired Friel’s play. The case study Sacks wrote about was not that of an Irish woman but of a 50-year old American man named Victor. His operation seems successful at first– but eventually it fails– his brain doesn’t know he’s seeing. Remember The Who’s Tommy— “his eyes react to light, the dials detect it.” Go to the mirror, boy. So knowing that that’s the way the story goes, will attending this play be “good for you,” but no fun? No. Because the characters have such great senses of humor and joy in life that they keep the stories interesting even when sad. Even when you know it can’t possibly end well– the stories are told in the past tense, and it’s obvious that nobody is speaking from the land of “hurray, Molly’s sighted and everything’s great,”– you still hope. You can’t help hoping. Not unlike the characters. Mr. Rice, as played by Jonathan Hogan, is down to earth, compassionate, greatly skilled and deeply sad. He drinks too much– though he has a steady hand– and he’s obviously haunted by his failures (not to mention the successes of his colleagues). Hogan, a multiple Tony nominee, fills this role with warmth and makes you care about his story too– although he functions primarily as observer. Ciarán O’Reilly (Irish Rep’s Producing Director) plays Frank as a lovable dreamer– an Irish type Friel has written before in such plays as Dancing at Lughnasa and Aristocrats. Frank loves well and he loves deeply– but he’s deeply weak, too. O’Reilly draws you in. In lesser hands you’d dislike the character– here you just, somehow, can’t. It’s perfect. Simone Kirby’s Molly is simply luminous. She’s funny, articulate and sensitive. She puts just the right amount of bravado on the character so that we’re not entirely fooled by her outward optimism– but even if we were, we hear the real story (hmm, switching to hearing now) from the surgeon and from Frank. She’s retreating into a world of her own just when the real world should come rushing in. There’s a mystery about her story that makes it truly haunting. Kirby embodies her terrible contradictions. Director Charlottte Moore has done some of her finest work here. She keeps the characters lively while inhabiting their own space, and the pace of the play never becomes ponderous. Jim Morgan’s simple set design nicely gives each character a slightly different window and chair, and lights by Richard Pilbrow and Michael Gottlieb eloquently bring out the wonder in seeing at all. Linda Fisher’s costume design also show us, visually, who the characters are. Friel is one of Ireland’s top playwrights– and like so many Irish playwrights, he’s also a poet. You should run to the production– and you should also read the play. Heck, read all his plays. Unlike some lyrical writers, Friel’s language doesn’t work better on the page than on the stage– but you’ll want to remember it. You won’t be able to forget the performance.